Full license key for Aiseesoft Total Video Converter that usually priced $45.00 is now absolutely free. On this short time offer, available unlimited code and the version given is lifetime license key. But seem, the registration code is only works on installer Aiseesoft Total Video Converter giveaway version. 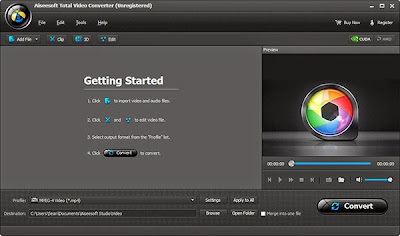 Aiseesoft Total Video Converter is one of the best video conversion tool on the market like MacX Video Converter Pro. The software features with GPU acceleration to convert as they can. It can convert up 80X faster than the competitor. Aiseesoft Total Video Converter supports 4K, 3D, & 2D videos. Also available watermarking tool to add copyright to your videos. There is two active giveaway license key for Aiseesoft Total Video Converter. Unfortunately all offer is a available for a short time only. Here the links. Giveaway page free Aiseesoft Total Video Converter: Visit this page! Alternative link: Visit this alternative! Before all offer expires, you can download the software from one of the link above. Visit one of the giveaway link above. Fill up the form requires to get free license and submit. Use valid email on this giveaway. The license will be sent to your email. Download the installer from the giveaway page. And use the license key in your email to activate. Caused all offer is a time limited. You can use coupon code to get the license after giveaway expires. Apply promo code “AISECPB” on the following link to get or buy Aiseesoft Total Video Converter with special discount. Buy Aiseesoft Total Video Converter Full License using coupon code: Buy now! Aiseesoft Total Video Converter is available for Windows only. The application provides easy ways to convert video into other video formats with ease.